Clear Creek is an October classic. 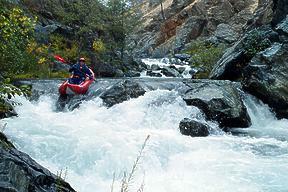 When little else is flowing in the autumn, Whiskeytown dam usually releases at least 200 cfs, the minimum boatable level for this run. Holbek lists the flow range as 300-600 cfs, with 600 cfs optimum. Personally I found it great fun at 220 cfs, as do many hardshell boaters. 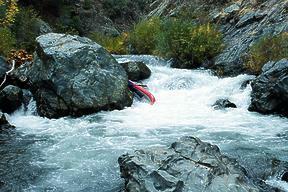 Shasta area paddlers report kayakers who run this canyon at 2000 cfs or more. 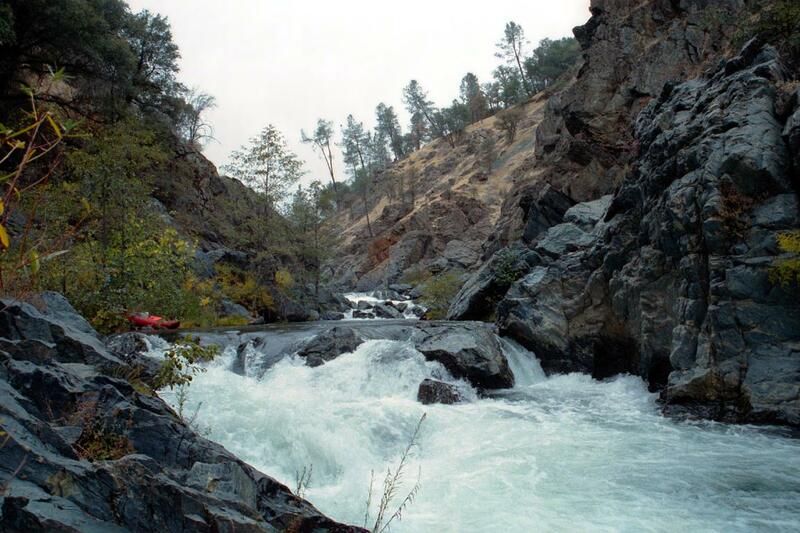 The Pillsbury run of the Eel has more fun rapids in a shorter distance, but lower Clear Creek contains more challenging rapids for those who like to scout, and because of location, is easier to combine with Burnt Ranch Gorge or the Yuba below Englebright dam. The usual put-in is at the NEED Camp bridge, about a mile below Whiskeytown Dam. There is a put-in just below the dam on river right, but the dirt road to there is not good (it stopped one Ford Explorer), and the rapids down to the usual put-in are just class II. The take-out recommended in the Holbek/Stanley book (A16 Placer Road) is much more difficult, with tough climb and no parking, than the take-out at Clear Creek Road recommended here. Holbek's take-out also misses a nice minigorge with class III+ rapids. At flows around 500 cfs this run contains mostly mellow class II and III rapids, except for perhaps 4 class IV rapids and one class V-. 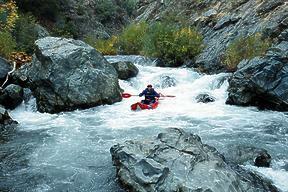 At flows around 220 cfs this remains true, with 4 class IV rapids if you count the subsequent drop of the class V-. The canyon is very scenic and seems quite remote, with the road perched high out-of-sight the left bank. Evidence of severe flooding just below the put-in indicates that when the dam spills, there is lots more water! 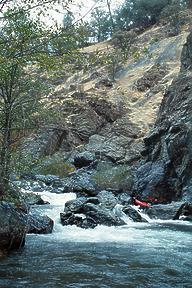 Below the NEED Camp bridge, Clear Creek immediately enters a scenic canyon with fun but relatively mellow class II-III rapids. After a couple of miles the creek enters black bedrock, where boaters encounter Pinch Me, a tight class IV that can be scouted on either side but portaged only on the left. Below that the river flattens out for a couple of miles. About a mile above the A16 Placer Road, boaters suddenly encounter the horizon line of a class V- rapid. Scout or portage left, but watch for body trap chutes near the landing. 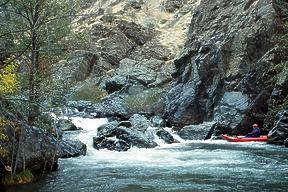 In December 2012, popular kayaker Shelbi Arno drowned when her kayak became pinned by rocks in final drop of this class V- rapid, perhaps while she was looking upstream. The portage over big rocks on the left is not very difficult. After a short pool, which might disappear at high flows, comes another class IV, best scouted on the right. Shortly below comes another rapid best scouted and run on the right. It seems class IV+ because the left side is very rocky at low flows, and appears to have entrapment potential. A ways below the creek bends left then right among willows and tumbles thru a narrow cleft in the bedrock. This class IV can be scouted high on the left. The old A16 Placer Road bridge appears shortly below the third or fourth class IV, depending on how you count. This was Holbek's take-out. Perhaps in the intervening years, vehicle access to the old bridge has been denied, and the carry up to the new A16 bridge is very tough indeed. Continue onwards into the next gorge, which contains some class III rapids culminating in a III+ drop. After a couple of miles in this gorge, the river flattens out and reaches the Clear Creek Road bridge. The carry up to your parking area is quite easy, as is the shuttle. Downstream of take-out, below a seasonal diversion dam, there is a class V+ waterfall followed by a class IV gorge that looks quite interesting. To reach take-out, take the South Bonnyview exit off I-5, between Anderson and Redding. When you are coming from the south, this exit is labeled Bechelli Lane and Churn Creek Rd. Drive west over the river on S Bonnyview until you cross the railroad tracks, then turn south onto highway 273 and proceed .8 mile to Clear Creek Road. If you cross the creek, you have gone too far. Turn west onto Clear Creek Road and drive 6 miles further to another bridge over the creek, your take-out. On the south (left) side of the road just after the bridge, there is a parking area near the sign for Horse Creek Preserve. To reach put-in from there, continue uphill on Clear Creek Road for about 1 mile, then turn right (north) on Cloverdale Road. In 1.5 mile, turn right again (east) onto A16 Placer Road. Drive about 1 mile downhill to the Clear Creek bridge, then uphill for about .5 mile. Turn sharp left on Mule Town Road, which is paved for several miles. At the end of habitations it turns to rough dirt with occasional pavement. Avoid several lesser-travelled dirt roads that fork left. After bending away from the river, curving left downhill and crossing Middle Creek, then curving right uphill again, you reach an intersection. Turn left, following signs to “Whiskeytown Dam”, not to the town of “Shasta” on highway 299. The road descends to a pack camp, then descends again towards Clear Creek. After a flat spot and a rise you reach a paved road. Turn left, following signs to the “NEED Camp” bridge. A right turn leads to the top of the dam, making an alternate long-cut for low-clearance vehicles. Low-clearance vehicles can reach put-in by returning to Redding, driving west on highway 299, turning south at the visitor center just before Whiskeytown reservoir, and proceeding downhill past Whiskeytown cemetery on Paige Bar Rd.